Can marital quality affect your risk of getting diabetes? The Journals of Gerontology® were the first journals on aging published in the United States. The tradition of excellence in these peer-reviewed scientific journals, established in 1946, continues today. 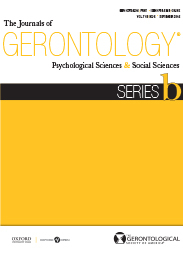 The Journals of Gerontology Series B® publishes within its covers the Journal of Gerontology: Psychological Sciences and the Journal of Gerontology: Social Sciences. Diabetes remains one of the top ten causes of death in the US, where the Centers for Disease Control and Prevention reports that over 9% of the population has diabetes. The risk of getting diabetes can be largely reduced through factors such as proper diet and regular physical activity. Many of the resources on diabetes focus on how lifestyle changes can lower the risk of diabetes and prevent harmful complications, yet much of this information ignores how social aspects of people’s lives—particularly the relationship they have with their spouse—can be related to having this chronic disease. A recent study, examined how the quality of a married couple’s relationship can affect the development and management of diabetes. Why would researchers suspect that marital relationships would have any effect on health, and even impact chronic disease? Research by Waite and Gallagher suggests that marriage is a special kind of relationship where spouses share their resources, make joint investments, and influence one another’s health behaviors. Diabetes is one disease closely tied to behaviors. It relies heavily on the patient following a day-to-day self-care regimen which can include careful timing of taking pills or administering shots, close monitoring of diet, and exercising on a regular basis. This intense self-management may be made easier in a marriage where the spouse can support and encourage these behaviors, or it could be discouraged in a marriage where spousal conflict could disrupt adherence to care. We analyzed two waves of longitudinal data from the National Social Life, Health, and Aging Project (NSHAP) to examine how marital quality is associated with the risk of developing diabetes and the management of diabetes among older adults. The study sample is nationally representative of community-dwelling adults, aged 57 and older. Diabetes status is measured both by self-reported doctor-diagnosis and by sugar concentration in the plasma being greater than or equal to 6.5%, per the American Diabetes Association guidelines. Positive marital quality includes aspects such as satisfaction and happiness, while negative marital quality is comprised of measures of strain and conflict/demands and criticism. The results show that the relationship between marital quality and diabetes depends on gender. For women, an increase in positive marital quality is related to a lower risk of having diabetes. For men, an increase in negative marital quality is related to a lower risk of having diabetes as well as better control of diabetes. It is surprising to find that an increase in negative marital quality actually helps men to better manage their diabetes. It challenges the assumption that negative marital quality would always be harmful to health. What explains this unexpected finding? One suggestion is that men who do experience an increase in their negative marital quality are more self-serving compared to other men and may already be more regulating of their health. Another suggestion is that the study’s measure of negative marital quality is more a measure of nagging behavior between the spouses, so a man whose wife is more critical or demanding of him may also have better health regulation. This pattern of health promotion has been seen before, as Umberson proposed that a social control of health behaviors exists among spouses, and evidence shows that this is more effective for husbands’ health than wives’. Better marital quality is beneficial in itself, but for women, it can also promote their metabolic health and decrease their risk of diabetes. Men’s experience of negative marital quality may be what lowers their risk of diabetes and even what slows its development. So, while living a healthier life is important to counteract the onset and progression of diabetes, this new research shows that there are social factors which can help older men and women as they face this chronic disease. Featured image credit: old people lovers by Huskyherz. Public domain via Pixabay. Hui Liu is an Associate Professor of Sociology at Michigan State University. Shannon Shen is a doctoral student in sociology at Michigan State University. They discuss the topic of this blog further in the article, “Diabetes Risk and Disease Management in Later Life: A National Longitudinal Study of the Role of Marital Quality” in the The Journals of Gerontology, Series B.